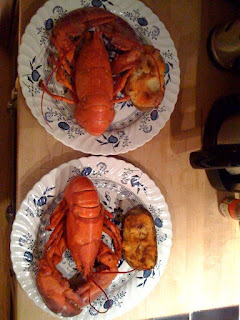 Gwendolyn Strong Foundation : Blog : Live New England Lobstas…Yummy! Yesterday, a surprise box was delivered to our house in the morning. 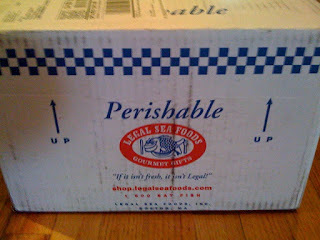 One of my best friends, Matt (who lives in Boston), sent us live lobsters from Legal Sea Foods, a New England mainstay. 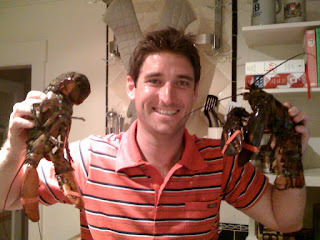 Matt was born and raised in Boston so I've heard my fair share of Legal Sea Foods stories over the years. But, I've never eaten there so this was a big treat! 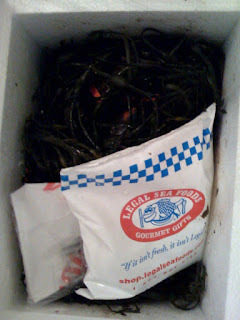 They were inside the box, inside a styrofoam container, wrapped in seaweed with a couple of cool gel pack "blankets" to keep them comfortable. And they seemed to be sleeping when we opened the box, but once we opened it up they started to get active (I think we woke them up). For the rest of the afternoon we could hear them scratch, scratch, scratching the inside of the styrofoam container. Kind of creepy. Luckily Legal Sea Foods does a great job of providing all of the instructions because we had no clue how to cook live lobsters. 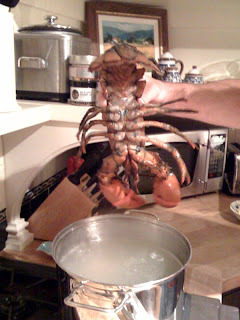 It's actually very, very simple - pot, water, salt, rolling boil...pick up lobster, drop in water head first...rolling boil...cover...wait 12 minutes (for this size)...done! And, oh were they amazingly delicious. It was a beautiful, foggy, chilly late May evening here so we sat out on our deck, turned on some music and a heat lamp, opened a special bottle of cabernet, and enjoyed cracking and clawing through every single last kernel of those lobsters. It was a really fun night and a great ending to a fun Saturday.